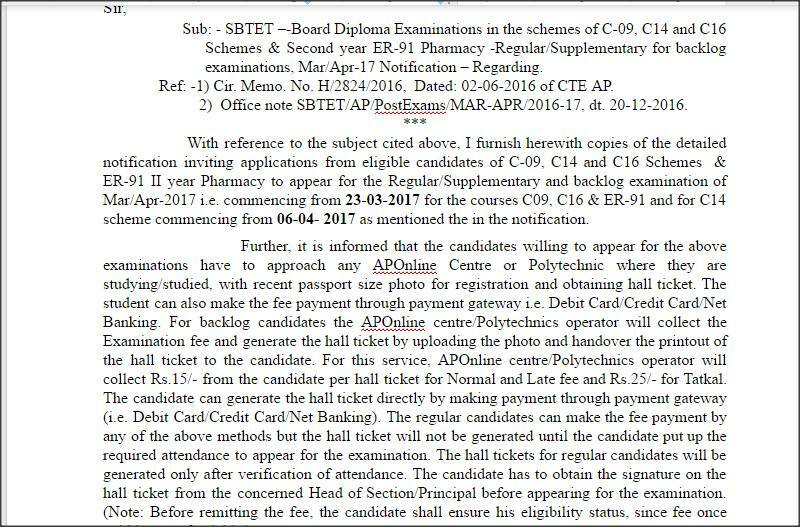 AP SBTET DIPLOMA EXAMINATION NOTIFICATION MARCH/APRIL 2017. Sri A Nirmal Kumar Priya, M.Tech, MISTE, MIEEE. Lr.No. 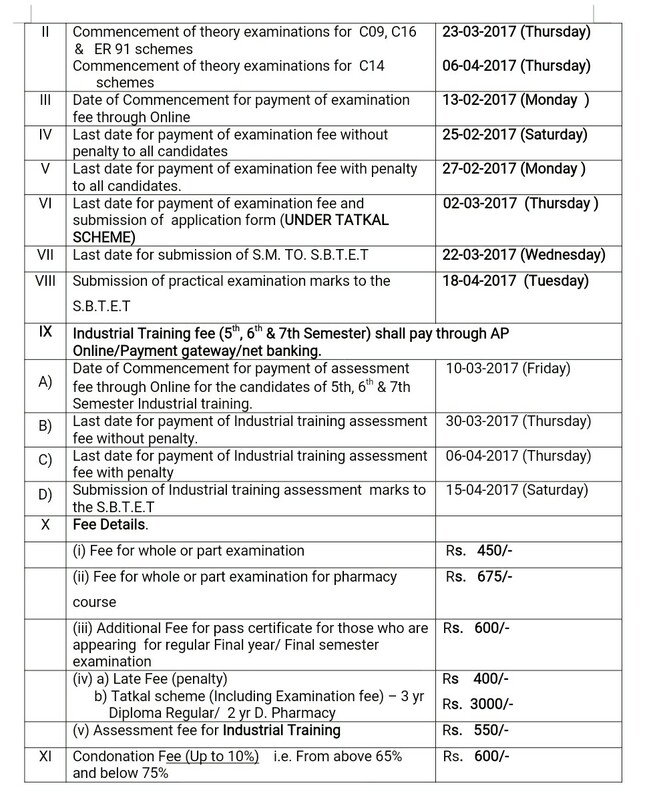 SBTET/Pre-Exam /Dip. /2824/Mar-Apr-17/2017. Dated: 11-02-2017. 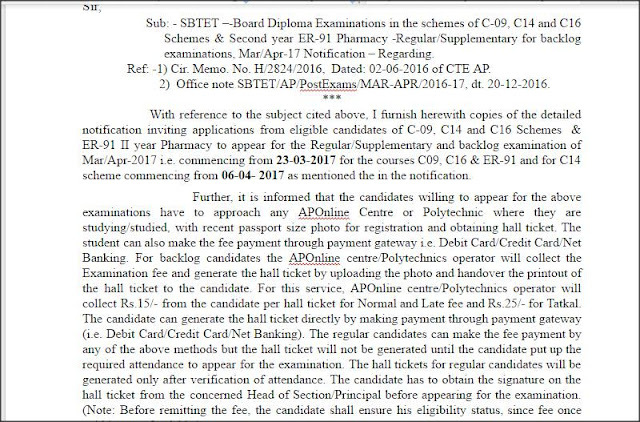 2) Office note SBTET/AP/PostExams/MAR-APR/2016-17, dt. 20-12-2016. A/ AA/ AEI/C/ CM/CCP/ EC/EE/ GT/ HMCT/ IT/ M/ MNG/PET/PCT/ RAC/CH/CHOT/ CHPC/ CHPP/ CHST/ MET/ TT/BM. C-16 I Year. AA/ AEI/C/ CM/CCP/ EC/EE/ GT/ HMCT/ IT/ M/ MNG/PET/PCT/ RAC/ CHST /BM. C-14 VI Semester. The following candidates are eligible for Mar/Apr -2017 Diploma Examinations as Second mercy chance subject to condition on Govt. Permission. Candidates admitted under C-09 Scheme during the academic year 2010-2011 in to 3 Year Diploma courses. Inter Vocational Course (IVC) candidates admitted under C-09 Scheme into II year (III Semester) Diploma Courses directly in the academic year 2012-2013 (Pin with ‘11’) batch of 3 Year Diploma courses. 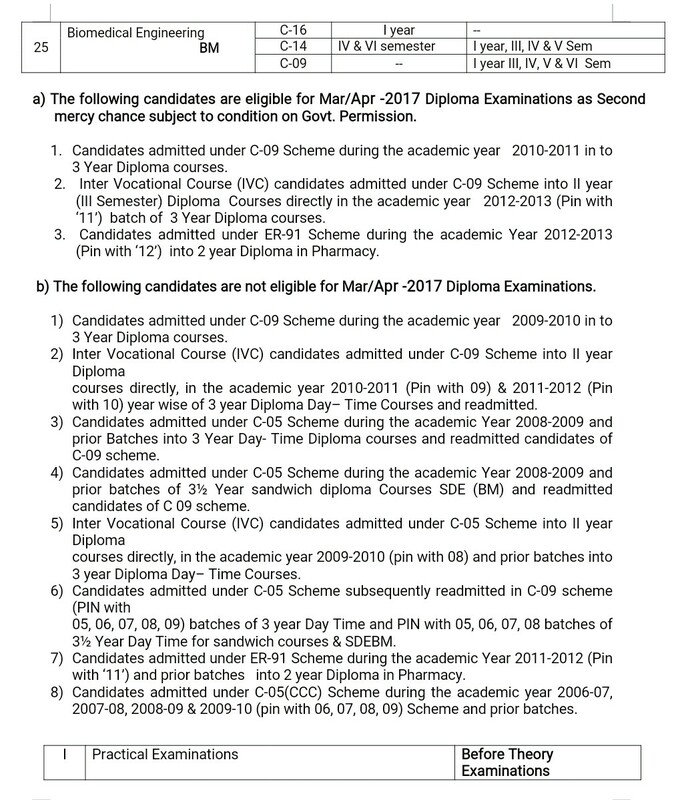 Candidates admitted under ER-91 Scheme during the academic Year 2012-2013 (Pin with ‘12’) into 2 year Diploma in Pharmacy. Candidates admitted under C-09 Scheme during the academic year 2009-2010 in to 3 Year Diploma courses. Candidates admitted under C-05 Scheme during the academic Year 2008-2009 and prior Batches into 3 Year Day- Time Diploma courses and readmitted candidates of C-09 scheme. 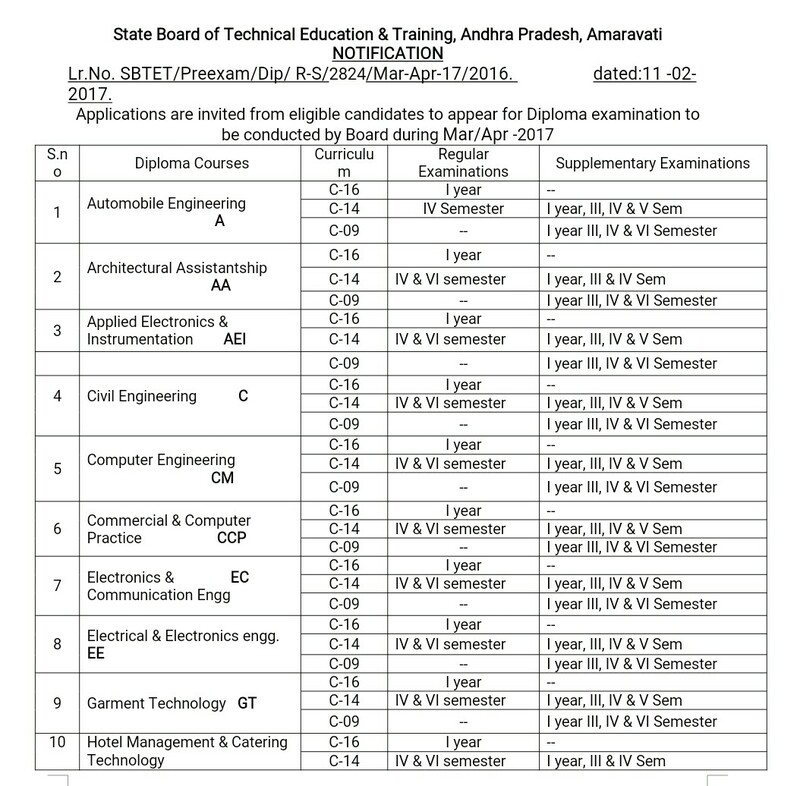 Candidates admitted under C-05 Scheme during the academic Year 2008-2009 and prior batches of 3½ Year sandwich diploma Courses SDE (BM) and readmitted candidates of C 09 scheme. 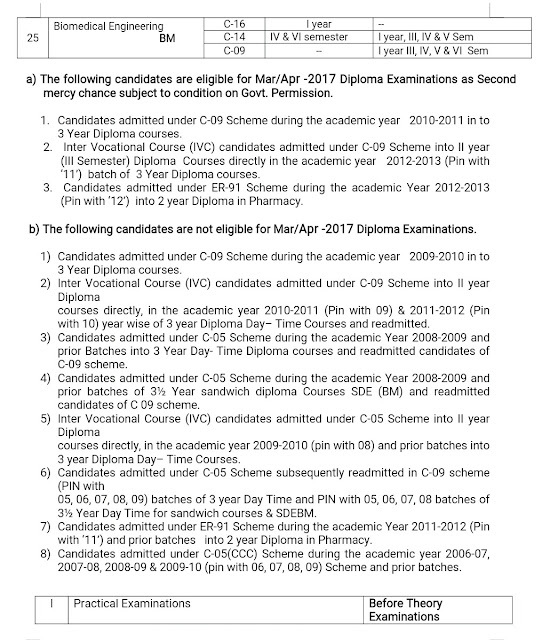 Candidates admitted under ER-91 Scheme during the academic Year 2011-2012 (Pin with ‘11’) and prior batches into 2 year Diploma in Pharmacy. 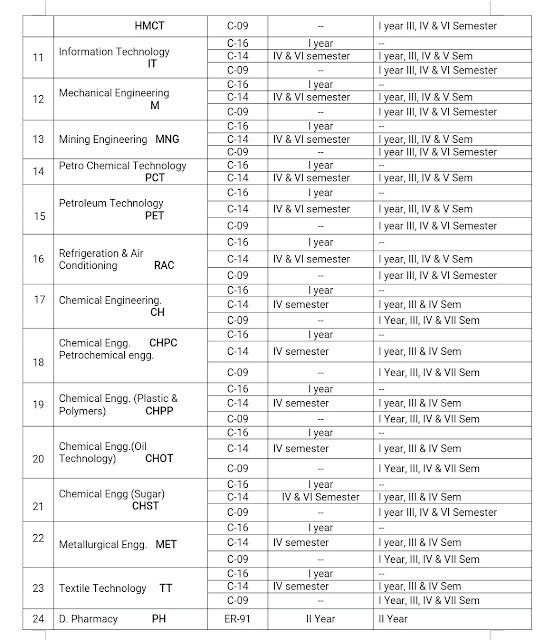 Candidates admitted under C-05(CCC) Scheme during the academic year 2006-07, 2007-08, 2008-09 & 2009-10 (pin with 06, 07, 08, 09) Scheme and prior batches. SBTET TIME TABLE AVAILABLE @ SBTETWORLD.